repair, all three, he said. This book really does give the secrets of how to repair your on-line reputation and how to set yourself up in a defensive position prior to an attack. The techniques work. 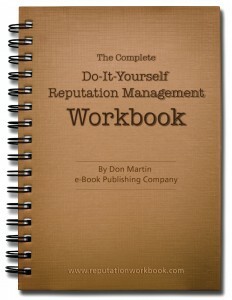 Before he published this book, I called on Don to help a client whose property management company was receiving false reviews from a disgruntled ex-employee. A few of his techniques solved the problem. Those techniques and a whole lot more are in the book. A surprise addition to the book, the extended glossary, is a very helpful bonus.